Takka Saaru is a very simple and healthy soup. It is a very old Konkani dish. In Konkani taaka means buttermilk. I tried this for the first time. You might not believe it tasted out of the world! Never thought it would turn out this good. Each ingredient added to this saaru has contributed its own flavor and the result is a yummy saaru/soup. This is a very good accompaniment to rice. Try this healthy yet tasty saaru. I am sure this is a treat for the yogurt lovers! You can as well use Buttermilk for this saaru. Then you might have to decrease the amount of water added. Chop the onion and garlic. Then wash cilantro and give a rough chop to it. Now heat ghee and then add cumin seeds. After few seconds add chopped onion and garlic. Fry them until they turn translucent. Then add chopped green chillies and whole peppercorns. Continue frying for 1-2 minutes. Then add Chopped cilantro and salt. Fry for a minute or two. Turn off the heat. Allow it to cool. Then grind it to get a paste (don't worry if its not a fine paste). Now take a bigger dish and then add curd, water and the prepared paste. Mix it well and start heating it on a low flame (yes it has to be heated on a low flame otherwise you end up spoiling the texture of the curd). Stir it continuously. Once the mixture is hot enough, turn off the heat. Takka Saaru is ready!! Shyavo or Sev is a very simple snack. It is very easy to make and requires very few ingredients. It doesnot require any special preparation. Try making this and enjoy the goodness of fresh home made Sev! Take all the ingredients except oil, in a bowl. Mix it well to remove the lumps (At this point you can add a tea spoon of hot oil to the flour mixture). Then with greased hands, adding little water at a time, make a stiff dough. At the bottom of the mould we need to add the plate, which has many small holes throughout (I used the plate with slight bigger holes because I didn't have the one with smaller holes). Now put the dough into the mould and then start rotating it in clockwise direction in the hot oil directly, until there is enough room for the noodles to get fried evenly. To stop the noodles from coming, rotate in the opposite direction. Fry the noodles on a medium flame on either sides, until the sev turns slight brown. Take out the sev from the oil and drain the excess oil on a paper towel. Shyavo is ready!! 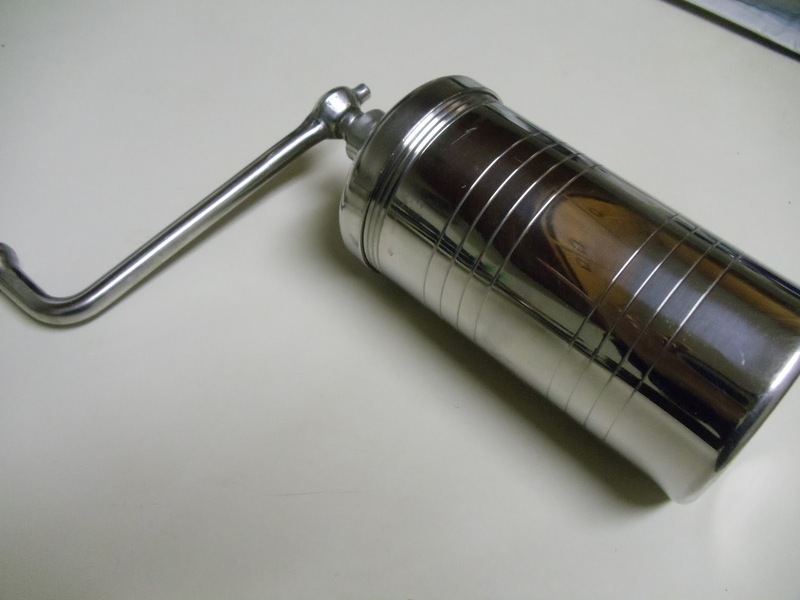 Allow it to cool and then store in an air tight container. You can as well break the long noodles into tiny bits and then use it for chaats or to serve it along with upma etc. Maddi Podi is a very delicious fritter. Maddi is nothing but the taro root. You can know about it here. The size and shape of the taros differs from region to region. The taros which were available in my native were huge. I got a small variety from a Chinese Store. The taste was equally good. Try making these crispy fritters and enjoy! Wash and soak the rice for an hour. Meanwhile, wash the taro root. Remove the outer dark skin with a peeler or a knife. Then cut it into circle or semi- circle shaped slices (or any other shape), of 1/4 cm thick. Now, drain the water of the rice and grind it along with dry red chilli, coriander seeds, salt, asafoetida (if using). Make a fine paste using minimum amount of water. Transfer this paste into a bowl. Now add little water to the rice paste, to make it dropping consistency and not watery (add water very carefully). Then start dipping each of the taro root pieces in this paste to get a light even coating throughout. Deep fry the coated taro root slices in hot oil on a medium-high flame, until it turns crispy on either sides. Remove from oil and drain it on a paper towel, to remove excess oil. Maddi Phodi is ready! Note: If taro root is not available then you can as well substitute it with cauliflower, onion, raw jack fruit, sweet potato, potato etc. Cabbage Upkari is a very simple konkani dish. I can say it is a basic dish and very easy to prepare. Cabbage is an excellent source of Vitamin C and also a low calorie vegetable and hence very helpful for those who are dieting. Enjoy this healthy, low calorie dish! Wash and chop the cabbage and Onion. Heat oil. Add mustard seeds. Once it starts spluttering, add chopped onions. Fry for a minute and then add urad dal, slit green chilli and curry leaves. 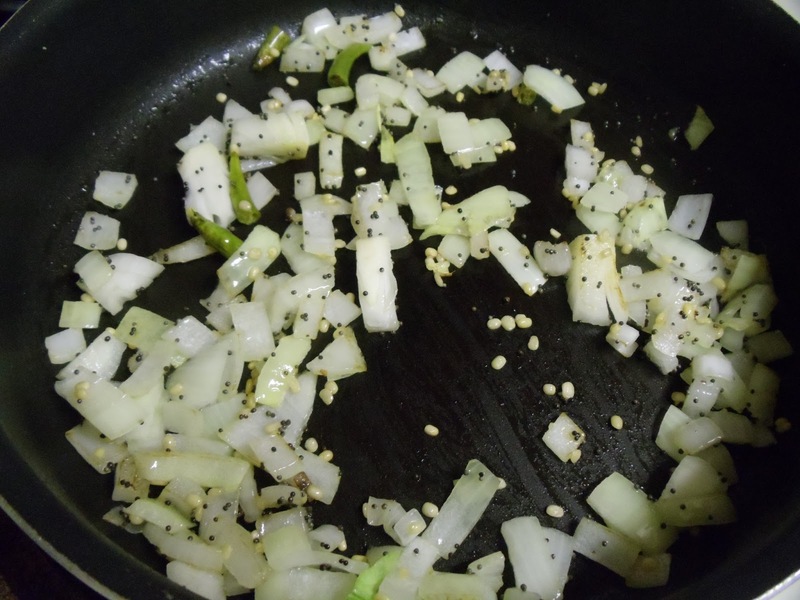 Fry until the onion turns translucent and urad dal turns light brown. Now add chopped cabbage, salt and mix well. Close it with a lid and let it cook on a medium flame. Add water, if required (cabbage will give out some moisture after adding salt). Once the cabbage looks cooked, add grated coconut and then turn off the heat (don't over cook the cabbage). Cabbage Upkari is ready! Serve it hot as a side dish to rice, roti. Above measurement serves two people. Sabutandla Polo is a simple dosa. 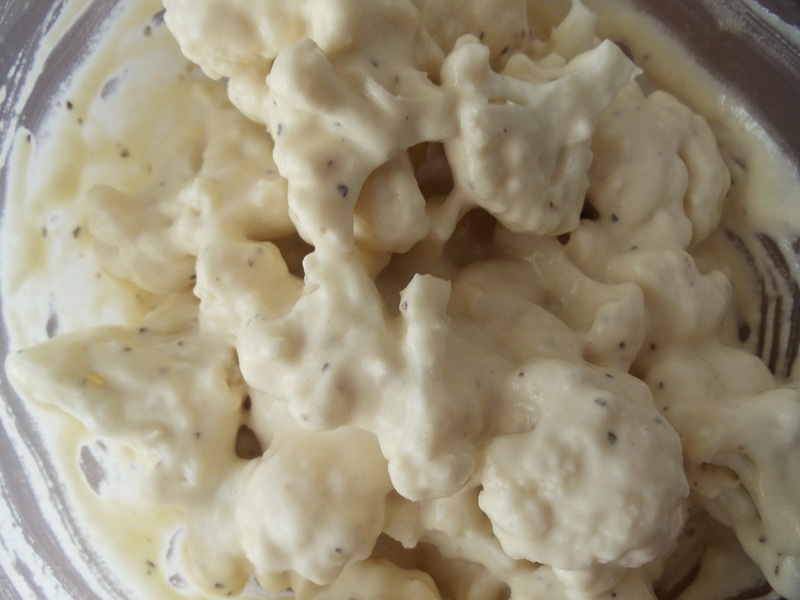 In Konkani, sabutandulu means tapioca/sabudana. I was very much interested to try this dosa, when I saw it in a Facebook group. She has also posted it here. I just made very slight variations. This dosa has a very different texture. Give it a try! Soak rice and fenugreek seeds in one bowl. In another bowl take tapioca, flattened rice and curd. 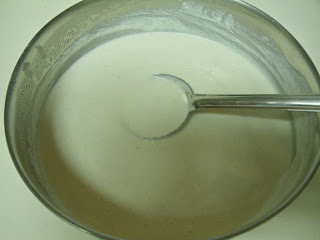 Add half a cup of water (to dilute the curd). Soak them separately for 4-5 hours. Pour a ladel full of batter on the heated pan or tawa. Don't spread the batter, unlike other dosa. Close the lid. Let it cook on a medium flame. 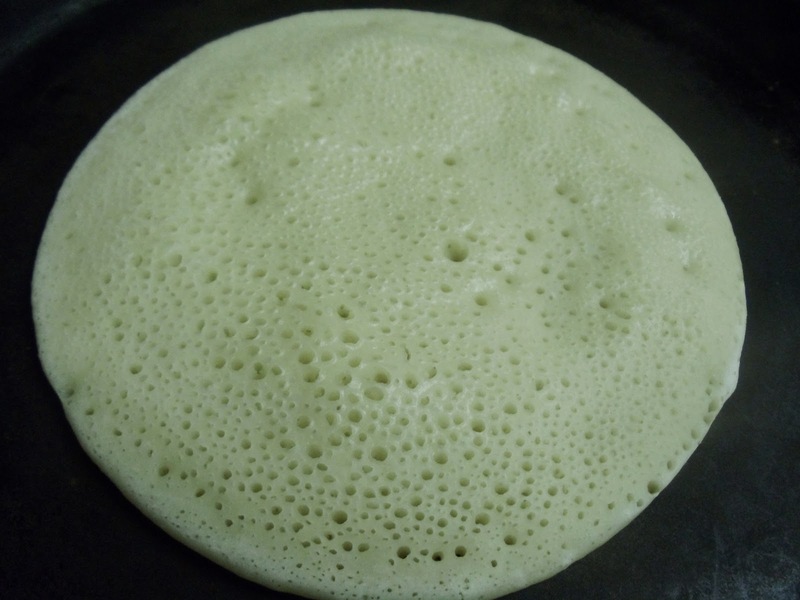 Once it fully cooks, tiny holes can be seen throughout the dosa (If the holes doesn't form then, the dosa will be very flat and the desired texture is not got. Hence in such a case, add 1/2 tsp of baking soda to the batter). 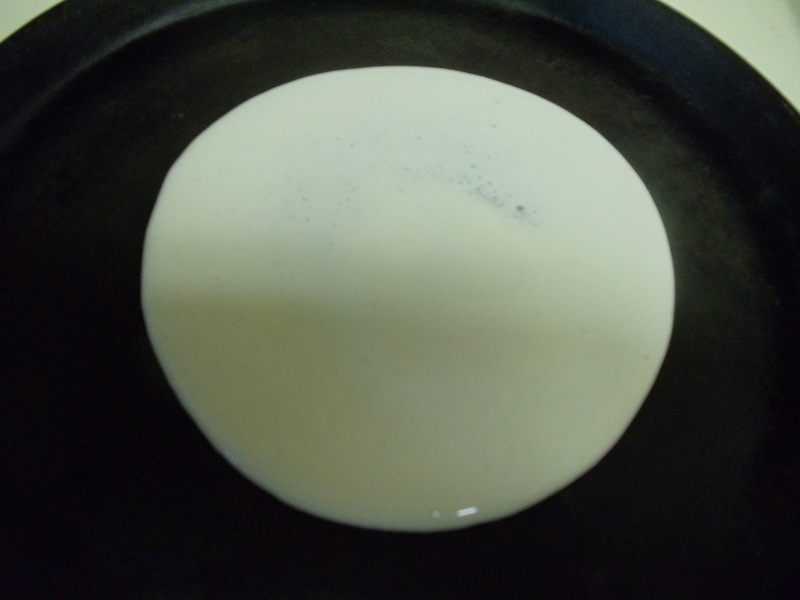 After 1-1.5 minute (it might vary for you), the dosa gets cooked completely and its base turns light brown. Remove the dosa from the tawa. Sabutandla Polo is ready!! Serve it hot with Coconut chutney or any curry of your choice. Above measurement serves two people. 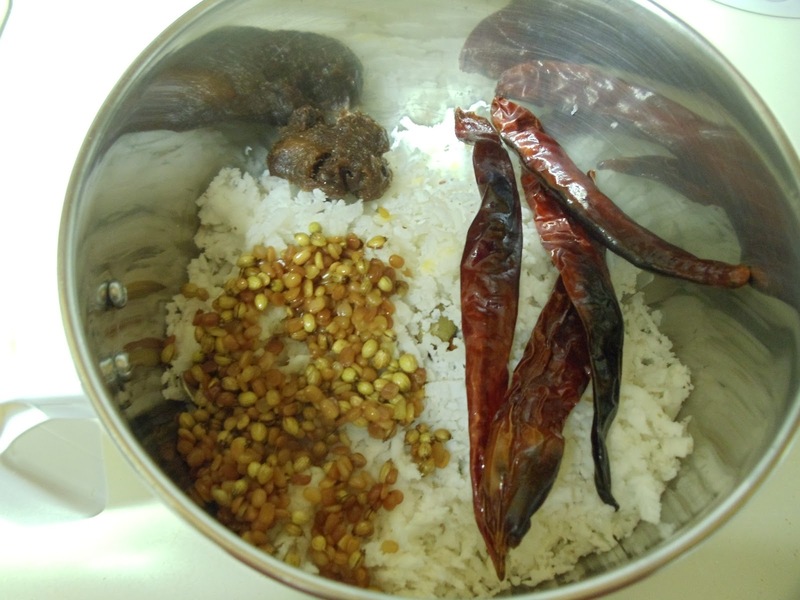 Donnemirsange Sukke is a simple Konkani dish. Donnemirsanga in Konkani means Capsicum. I got this recipe from my amma. I remember amma making this often as it was my brother's favorite. This dish has a very unique taste because potato and capsicum are cooked in a coconut based masala. Try making this and enjoy! 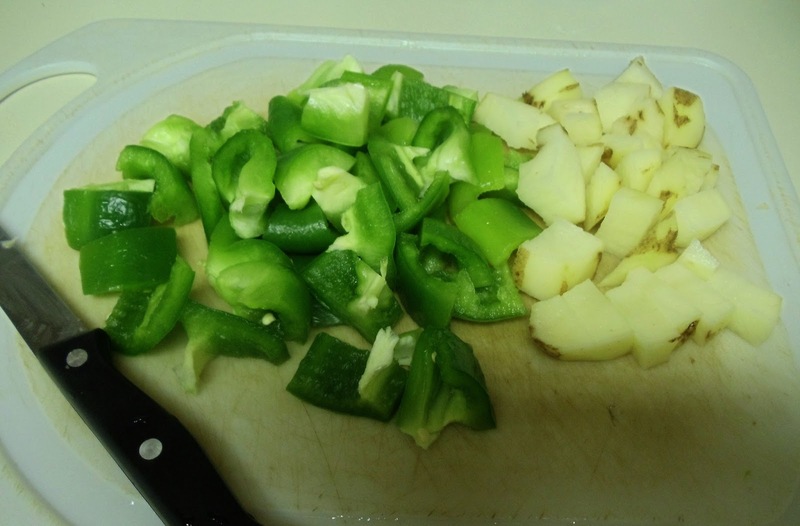 Wash and cut the capsicum into square pieces. Then cube the washed and peeled potato. Now grind grated coconut, roasted red chillies, tamarind, salt, roasted coriander seeds and urad dal, to get a coarse mixture. Add little water so that all the things come together. Don't make the masala very fine. Now take a kadai and heat oil. Add mustard seeds. Once it starts to splutter, add curry leaves. Then add the chopped potato and fry for a minute or two. 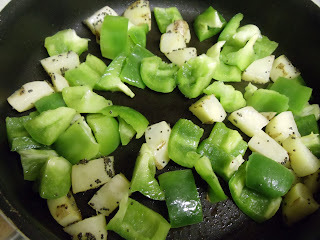 Then add chopped capsicum and mix well. Let it fry for 1-2 minutes on a medium flame. Now add the ground masala and mix well. Add water as required and check for the salt. Close the lid. Continue cooking until the potato becomes soft. The consistency of the dish is little dry (I always make it little watery). Donnemirsange sukke is ready! Serve it hot as a side dish to rice, dosa. Above measurement serves 2-3 people. 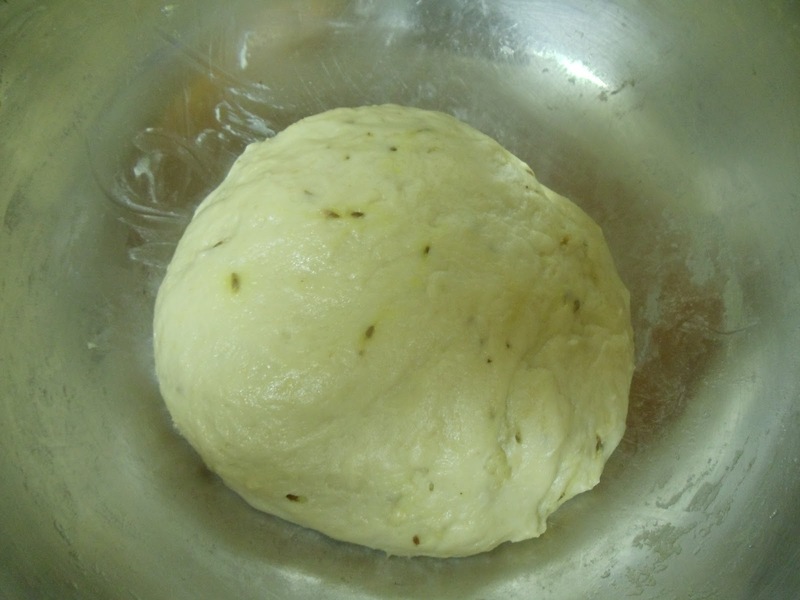 You can as well add finely chopped green chillies while making the dough. Take a ripe banana in a mixing bowl. Mash it well . To this add yogurt, sugar, baking soda, cumin seeds, salt and mix well until the sugar dissolves completely (don't add water).Now to this mixture add 2 cups of flour and start mixing. Remaining 1/2 cup of flour has to be added in small quantities. Final resulting dough has to be very soft. If the dough is sticky then add little amount of flour. Knead the dough for few minutes. (Finally I added a tsp of oil on the top of the dough). Keep the dough covered for 5-6 hrs. Now divide the dough into 5 equal parts. In a small plate take few Tbsp of flour for dusting. 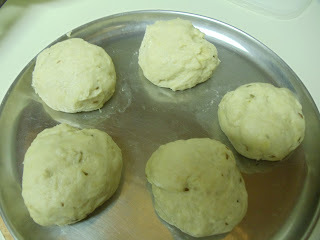 Take one ball and roll it in the flour and make a roti (Thicker ones). Then place it on a hot tawa. After few seconds, the bubbles start appearing and then flip the roti. Fry until brown spots are got on either sides of the roti. Apply oil/ghee, if using. Look how the roti is puffing! Vastaad Rotti is ready! Serve it hot with any curry or dal of your choice. Above measurement makes five big sized rottis. Note: #You can as well try adding a Tbsp of besan/chickpea flour and butter while making the dough. This will give you more soft and rich rottis. #You can substitute half the quantity of all purpose flour with whole wheat flour. This will make the rottis little denser but still tastes equally good. #I rolled these rottis the normal chapathi size (thicker ones). You can as well roll them like thick poories and then shallow fry them. Now, I don't make that often because my husband doesn't like spicy food. V- Is lunch ready dear? After reaching home, he saw the gravy and tasted a bit. V- aaah..this is too spicy for me. Why did you make it so spicy ? I am not going to eat it. So what happened next..both of us enjoyed eating it without leaving a bit (even though our taste buds were shouting). 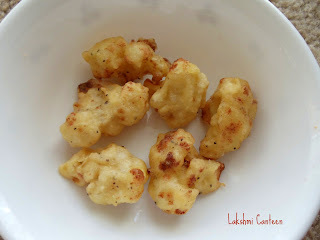 So enjoy making this delicious spicy gobis. I am sure you all will enjoy eating it. Peel and chop the onion. Now heat oil in a kadai and add chopped onions. Fry it on a medium flame until it turns translucent. Now add grated ginger and garlic to the onion and continue heating till it turns light brown. Meanwhile make a paste of dry red chillies and tamarind by adding required amount of water. Now add the ground paste to the onion mixture and mix well. Add salt to taste and water, if required. Adjust the consistency of the gravy to medium thick or little more thinner than that. Bring it to a boil. Then continue heating for 2-3 minutes. Turn off the heat. Now the gravy or the Spicy Tangy dip is ready. Transfer it to a serving bowl. Next step is to make the cauliflower fritters. Cut the cauliflower into bite size florets and wash them thoroughly. If it has worms then soak the florets in hot salt water for 10 minutes and drain the excess water completely. Now take a mixing bowl and add all purpose flour, corn flour, pepper powder and salt. Mix it well and then add water little by little to form a thick paste. 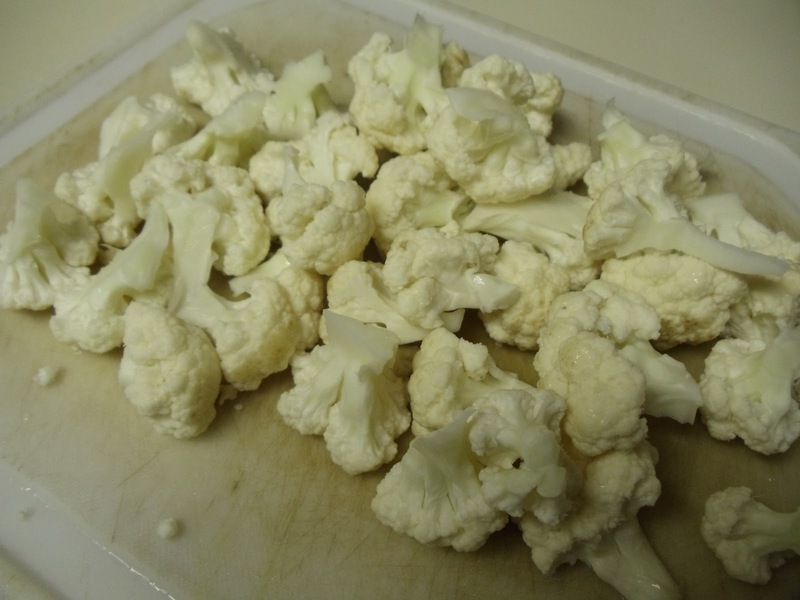 Then add the cauliflower florets and mix well. See that all the florets get an even coating. Fry them in oil, until they turn golden brown. Drain the excess oil on a paper towel. The cauliflower fritters are ready! So now, it is ready to dig in! Use the spicy tangy gravy as a dip for the fritters. Another way of serving it, would be- Take few fritters in a bowl and add few teaspoons of the spicy tangy gravy on it and let it rest for five minutes (so that the fritters will absorb all the juices). Then serve the soft, spicy gobi! Hmmm..Its just heaven! Serve this dish hot. Above measurement serves two people. Note: # Don't use chilli powder instead of dry red chillis. The freshly ground chillies gives a very good taste to the gravy. # The spicy gravy is also a good side dish for rice, dosa, idli or rotis. #I would recommend to try the gravy with Panpolo. Its an excellent combination. Batate Gojju is a very simple, old konkani dish. In konkani, batate means potato. This dish requires very few ingredients and it is very hard that you can go wrong while preparing it. I remember my amma used to make this. I never liked it as I am not a big fan of potato. So she eventually stopped making it. My MIL makes it regularly because the whole family is a big fan of this dish. Hence I made for my husband, who is a potato lover (ssshhh..I wanted to post this dish in my blog..hence I made) and guess what? This time I liked it very much. I was wondering why I didn't like it as a kid! Try making this simple dish and enjoy. It is a must try for the potato lovers. Wash the potatoes and tomatoes. Chop them into pieces. Now cook the potato and tomato pieces in 2-3 cups (or as required) of water. Add chopped green chillies and salt while cooking. When the potatoes turn soft, turn off the heat. Allow the mixture to cool. Once it is warm, transfer the pieces to a bowl leaving behind the water (the water can be used later). Now mash these potato pieces using hand or a masher (don't make a fine paste). 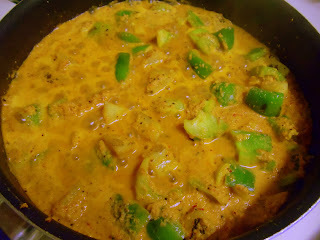 Then add asafoetida and the remaining water. Check for salt and also adjust the consistency. Consistency can be very thick or medium thick. The mixture is ready. For Seasoning- Heat oil. Add mustard seeds. Once it starts spluttering, add curry leaves and turn off the heat. Add this to the mixture and mix well. Batate Gojju is ready! !